• What do you think of people who patronize discount department stores? • Who is your favorite political figure? Open-ended questions are good as first questions on a topic. They enable the respondents to express general attitudes and opinions that can help the researcher interpret their responses to structured questions. Unstructured questions have a much less biasing influence on response than structured questions. Respondents are free to express any views. Their comments and explanations can provide the researcher with rich insights. Hence, unstructured questions are useful in exploratory research. A principal disadvantage is that potential for interviewer bias is high. Whether the interviewers record the answers verbatim or write down only the main points, the data depend on the skills of the interviewers. Tape recorders should be used if verbatim reporting is important. Another major disadvantage of unstructured questions is that the coding of responses is costly and time-consuming.’? The coding procedures required to summarize responses in a format useful for data analysis and interpretation can be extensive. Implicitly, unstructured or open-ended questions give extra weight to respondents who are more articulate. Also, unstructured questions are not suitable for self- or computer-administered questionnaires (mail, mail panel, CAPI, e-mail, and Internet), because respondents tend to be more brief in writing than in speaking. Precoding can overcome some of the disadvantages of unstructured questions. Expected responses are recorded in multiple-choice format, although the question is presented to the respondents as an open-ended question, Based on the respondent’s reply, the interviewer selects the appropriate response category. This approach may be satisfactory when the respondent can easily formulate the response, and it is easy to develop precoded categories because the response alternatives are limited. For example, this example may be used to obtain information on ownership of appliances. 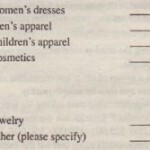 It has also been used successfully in business surveys, as shown by the following example. A major telecommunications firm conducted a national telephone survey to determine the attitudes of businesses toward telecommunication services. One of the questions was asked as an open-ended question with precoded responses. In general. open-ended questions are useful in exploratory research and as opening questions, Otherwise. their disadvantages outweigh their advantages in a large survey.’? Structured questions specify the set of response alternatives and the response format, A structured question may be multiple choice, dichotomous, or a scale. MULTIPLE-CHOICE QUESTIONS In multiple-choice questions, the researcher provides a choice of answers and respondents are asked to select one or more of the alternatives given, Consider the following question. Do you intend to buy a new car within the next six months? Several of the issues with respect to itemized rating scales also apply to multiple-choice answers, Two additional concerns in designing multiple-choice questions are the number of alternatives that should be included and order or position bias The response alternatives should include the set of all possible choices, The general guideline is to list all alternatives that may be of importance and include an alternative labeled “Other (please specify).” as shown here. The response alternatives should be mutually exclusive, Respondents should also be able to identify one, and only one, alternative, unless the researcher specifically allows two or more choices (for example, “Please indicate all the brands of soft drinks that you have consumed in the past week”), If the response alternatives are numerous, consider using more than one question 10 reduce the information-processing demands on the respondents. DICHOTOMOUS QUESTIONS A dichotomous question has only two response alternatives: yes or no, agree or disagree, and so on, Often, the two alternatives of interest are supplemented by a neutral alternative, such as “no opinion,” “don’t know,” “both,” or “none,’,22 The question asked before about intentions to buy a new car as a multiple-choice question can also be asked as a dichotomous question. Another issue in the design of dichotomous questions is whether to include a neutral response alternative. If it is not included, respondents are forced to choose between “yes” and “no” even if they feel indifferent. On the other hand, if a neutral alternative is included, respondents can avoid taking a position on the issue, thereby biasing the results, We offer the following guidelines, If a substantial proportion of the respondents can be expected to be neutral, include a neutral alternative, If the proportion of neutral respondents is expected to be small, avoid the neutral alternative. 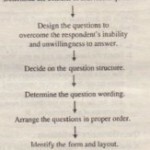 The general advantages and disadvantages of dichotomous questions are very similar to those of multiple-choice questions, Dichotomous questions are the easiest type of questions to code and analyze, but they have one acute problem: The response can be influenced by the wording of the question. To illustrate, the statement, “Individuals are more to blame than social conditions for crime and lawlessness in this country,” produced agreement from 59.6 percent of the respondents, However, on a matched sample that responded to the opposite statement, “Social conditions are more to blame than individuals for crime and lawlessness in this country,” 43.2 percent (as opposed to 40.4 percent) agreed.23 To overcome this problem, the question should be framed in one way on one-half of the questionnaires and in the opposite way on the other half, This is referred to as the split ballot technique. This is only one of several scales that could be used to ask this question As shown in the following example, a survey may contain different types of questions. Q. Are you using an e-ticket (electronic paperless ticket) on this trip? Q. Based on your experience of today’s flight, would you select this airline for your next trip on this route?